Originally drafted by the New York Mets in the 15th round of the 2010 MLB June Amateur Draft from Sonoma State University, Tillman Pugh never really put it all together in his first three minor league seasons. This isn’t out of the norm. When it comes to independent league success stories, there seems to be a pattern when players don’t quite fit the bill in their first MiLB go around. But a trip to the independent leagues provides a platform to get back to the basics and have these players put up the numbers they’re capable of. Pugh batted .225 in his first three years where he split time between the New York Mets and Chicago White Sox organizations. His first foray in the Independent leagues was a success. 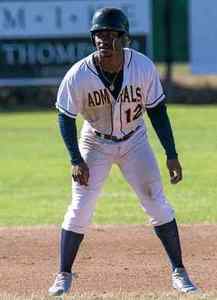 As an original member of the Vallejo Admirals, he put up the best numbers of his life; .303 average, .932 OBP and 11 home runs with 44 RBI, 77 runs scored, a and league best 43 stolen bases. Fast-forward three seasons and those personal bests have now been surpassed by MVP results. After a tough 2016 when he was released by the Schaumburg Boomers of the Frontier League, it was back to the drawing board. Being closer to home was the consistency he needed. 2017 was the year Pugh finally put it all together. Not only was he recognized for his play on the field; 18 home runs, 58 RBI (top four in the league), 30 stolen bases and a 22-game hitting streak, he was acknowledged for his preparation and leadership. With the 2018 season just around the corner, there’s no word yet if Pugh will be signed by any MLB organization. Until then, there’s no doubt he’ll will continue to do whatever it takes to get to that next level.